The feel of fall is definitely in the air. And while I am always so sad to see the summer go, there is so much that is beautiful about the fall too. Those first few crisp autumn mornings make me crave a warm breakfast. Oats are something I can no longer have, due to food sensitivities, so I’ve been exploring some alternate grains for breakfast. 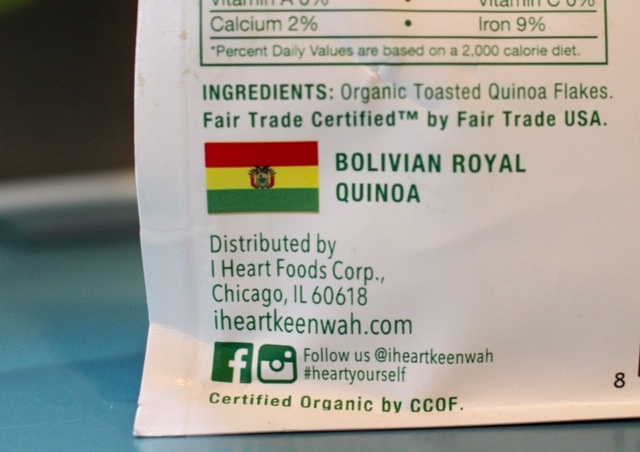 I was so excited to find I Heart Keenwah toasted quinoa flakes. I originally found these at Roche Bros, but have since spied them at other markets as well. 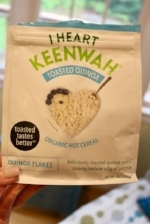 I Heart Keenwah has some other quinoa snack products too. 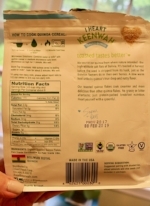 What do I love about I Heart Keenwah Organic Hot Cereal the most? They have only one ingredient! That’s right. Just one. Toasted quinoa flakes. I have used them as a substitute in recipes too, in place of bread crumbs. To prepare this delicious bowl of yummy warm goodness, I heated hazelnut milk to a simmer. You could also use water, regular milk or any other plant-based milk. I stirred in a half cup of toasted quinoa flakes and cooked them for two minutes, stirring occasionally. That’s it! Chances are good that your Saturdays are like mine – busier than the weekdays! I like to get a workout in early (barre with LeAnna is the best!) and then fuel up with a power-packed breakfast. To this hot cereal, I stirred in cashew butter (yum! ), and then topped it with fresh blueberries and chia seeds. My other favorite stir-in is pumpkin seed butter. And I’ve also topped with fresh raspberries, chopped pecans and hemp seeds. The most amazing thing about this cereal is how sweet it tastes – even if you stir in nothing at all! Toasting the quinoa somehow brings out the best in this grain. When you shop at a grocery store, you have to sift through a lot of products to find a gem like this one. The typical grocery store houses somewhere between 35,000 and 47,000 products on their shelves. And every year lists are published, such as Best New Products of the Year. But how cool would it be to have a list of the Best Products with 3 Ingredients or Less? Products that are not just nutrition juggernauts, but that taste great too. Like Erehorn Corn Flakes. Just two ingredients in that cereal. Two! Organically grown corn and sea salt. Compare that to the ingredients on a well-known other brand of corn flakes: milled corn, sugar, malt flavor, contains 2% or less of salt. bht added to packaging for freshness. vitamins and minerals: iron, vitamin c (sodium ascorbate, ascorbic acid), niacinamide, vitamin b6 (pyridoxine hydrochloride), vitamin b2 (riboflavin), vitamin b (thiamin hydrochloride), vitamin a palmitate, folic acid, vitamin d, vitamin b12. The well-known brand has added sugar and the controversial additive bht.